No doubt you've been in a titter the last few days, wondering exactly what had become of me. Well, rest easy, Gadgetboxers, for I have an explanation: I was attending the Penny Arcade Exposition, a gathering of video game enthusiasts that takes place annually in the greater Seattle area. 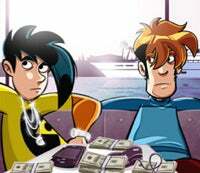 PAX is hosted by the creators of the Penny Arcade comic strip, Jerry "Tycho" Holkins and Mike "Gabe" Krahulik, who are avid gamers. There were several panels featuring Jerry and Mike over the weekend, in which they field questions of an often absurd nature, but some of them were interesting commentaries on the video game industry. Both, in particular, are outspoken about the upcoming PlayStation 3, and in one of this weekend's questions, they offered these juicy tidbits about the console's much discussed high price. "We've already talked about it, there's no chance we're buying a PS3 at launch. That's grade-A [B.S.]." "[The pricing]'s just nuts, and they need to understand that it's nuts."